So folks, here it is. Took me a few days longer as promised but finally I made it. 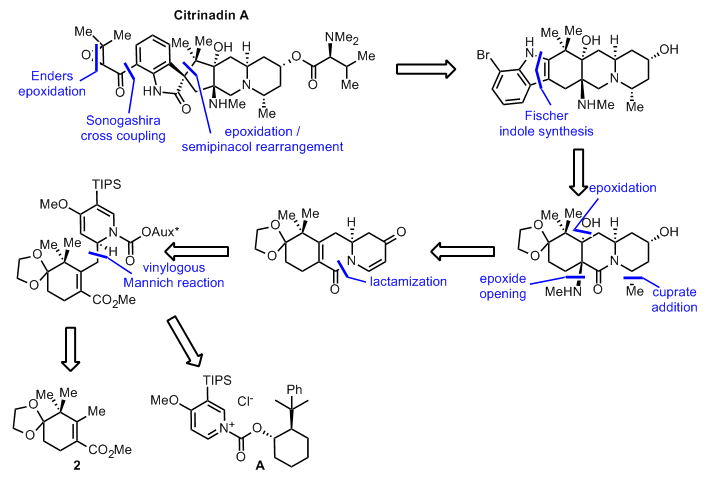 Though citrinadin A is closey related to citrinadin B the synthetic approach of the Martin group is much different from that of Wood et al.. Their retrosynthetic considerations are summarized in scheme 1. Interestingly the introduction of the epoxyketone utilizes almost the same chemistry under similar reaction conditions. Contrary to the Wood approach the spiro-oxindole is build up by an epoxidation / semipinacol rearrangement in a diastereoselective manner. 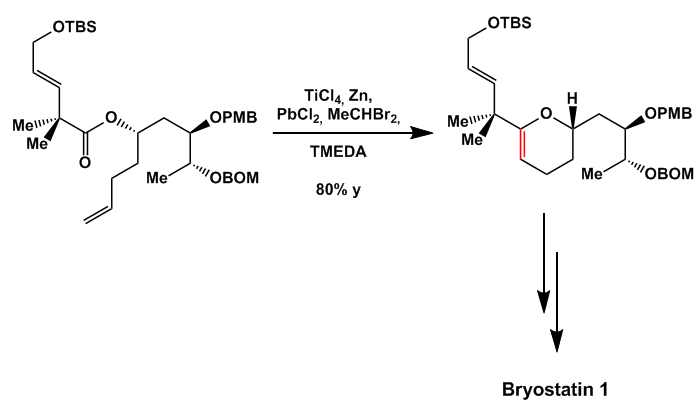 This disconnection leads back to the bromoindole shown which in turn is introduced by a Fischer indole synthesis. The tertiary alcohol and amine are derived from selective epoxidation / epoxide opening to give a lactam which tracks back to a vinylogous Mannich reaction between 2 and A.
Dimethylcyclohexadione 1 is monoprotected and methoxycarbonylated with dimethylcarbonate. Subsequent triflation and copper-mediated introduction of another methylgroup then leads to ester 2. In the presence of LDA and in situ transmetallation with zinc chloride a vinylogous enolate is formed which reacts with in situ formed pyridinium ion A. After acidic hydrolysis ester 4 is formed which undergoes base mediated lactam formation to give 5. 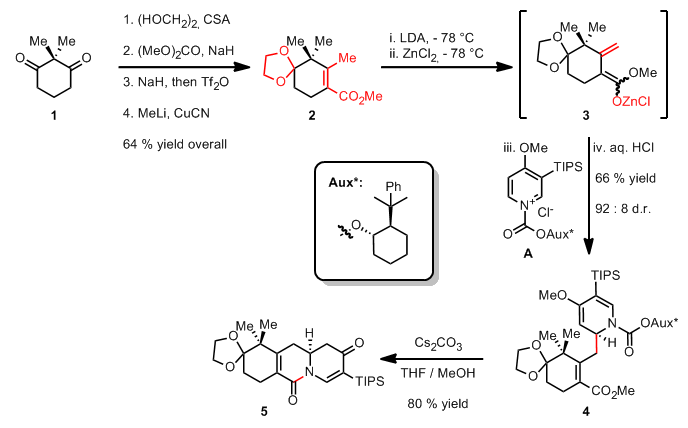 Next TIPS cleavage sets the stage for the stereoselective introduction of a methyl group which had to be accomplished in a two-step sequence. After cuprate addition derived from PhMe2SiCH2MgCl and reduction of the ketone the silylgroup was removed under harsh conditions to provide alcohol 8. Epoxidation of the unsaturated lactam with peracid and ensuing opening with dimethylamine then leads to 10. The dioxolane is then directly used in a Fischer indole synthesis with bromophenylhydrazine in aqueous sulfuric acid to give indole 11 in pretty good yield. Successive reduction of the lactam carbonyl was accomplished by combined alane / borohydride reduction which proved to give the best yields of 12. 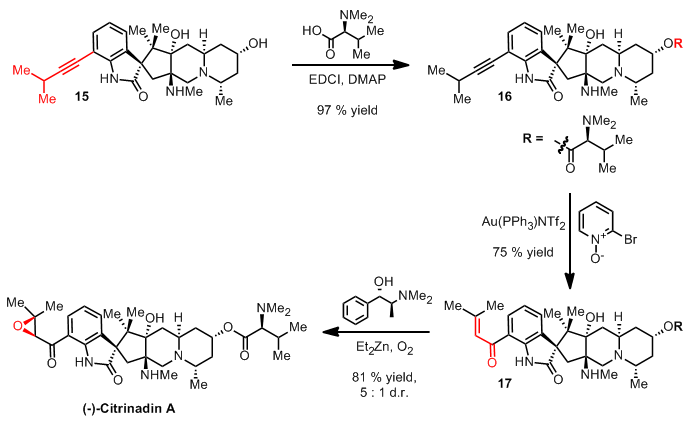 In situ protection of the sensitive amine moieties with PPTS and epoxidation with Davis oxaziridine yields an intermediate indoline which undergoes semipinacol rearrangement in the presence of acetic acid to give the core structure of the citrinadins with complete control of the quaternary carbon centre. Sonogashira coupling then provides alkyne 15. 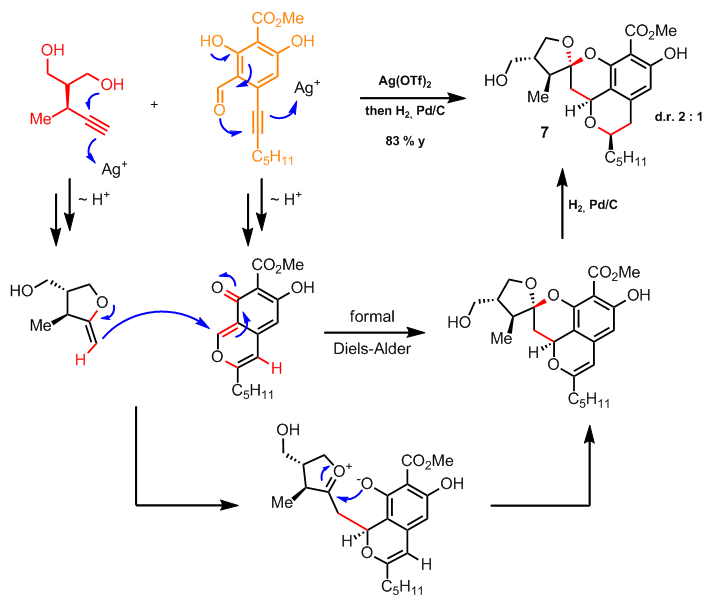 All that remains was to transform the triple bond into the epoxyketone which was accomplished after amide formation with dimethylvaline utilizing again the Gold mediated oxygenation and subsequent Enders epoxidation protocol (cf. Wood et al.). Pretty cool synthesis. 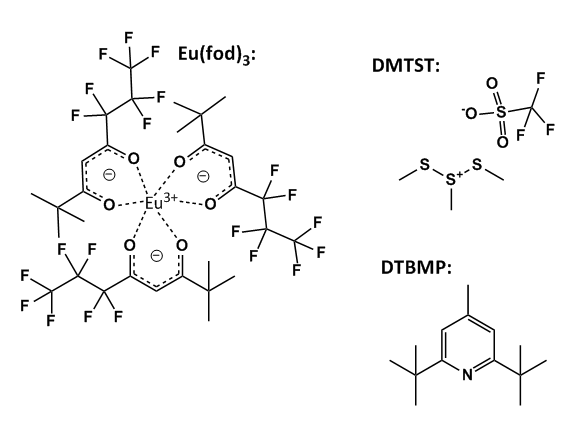 It was very intriguing to me to see two almost completely different approaches of the Wood and Martin group which were also published back to back and ultimately corrected the proposed structure of the citrinadins. It has been some time since my last entry. I was very busy with moving to the US and starting my master’s thesis. But as you can see after about 12 weeks I am back. I chose a rather short synthesis but there is still some work to be covered within the next weeks which should result in much more detailed write-ups. The synthesis begins with the union of azide 1 and bromooxindole 2. Because their initially reported conditions did not give any product at all it was found that the reaction proceeded smoothly in the presence of substoichiometric amounts of silver carbonate yielding 3. After tosylation the mixture was exposed to methanolysis to produce the backbone structure 4 of communesin F. Methylation with Meerweins’s salt, hydrogenolysis of the azide with subsequent Boc-protection and detosylation furnished amide 5. The bromine was then used as a handle to introduce the prenyl sidechain with a Heck reaction to give an intermediate allylic alcohol. In the presence of mercury salts a cyclization took place constructing the crucial seven-membered amine ring. Deprotection of the amine under mild conditions using TBSOTf was followed by amide formation with some help from trimethylaluminium. The second side-chain was introduced in the usual sequence of deprotonation and subsequent alkylation with iodoacetonitrile. The last ring was closed in a straightforward manner. Reduction of the nitrile to the aldehyde and the amide to the hemiaminal gave tetrahydrofuran 9. 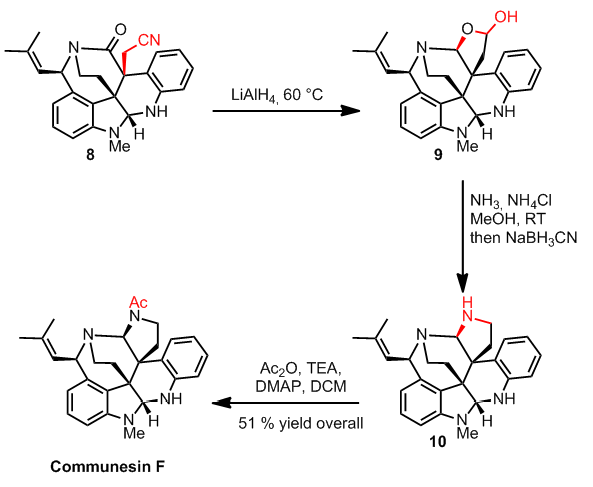 Reductive amination and acetylation finally produced communesin F in an overall yield of 6.7 %. The mechanism of the key step is pretty straightforward but nevertheless a nice one. 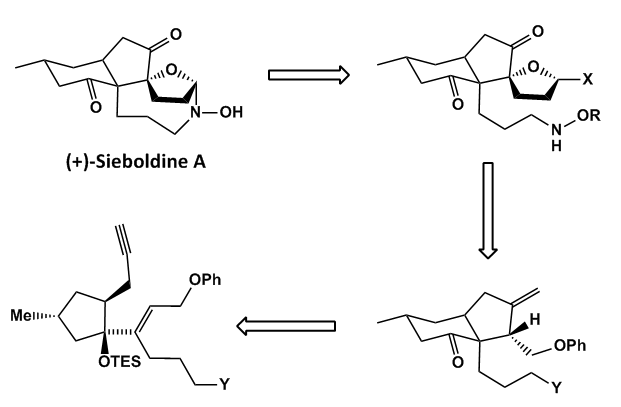 After tosylating the oxindole nitrogen the resulting amide can be cleaved by methoxide to give an anilide anion which undergoes intramolecular attack on the indolenine 2 position to close the ring. 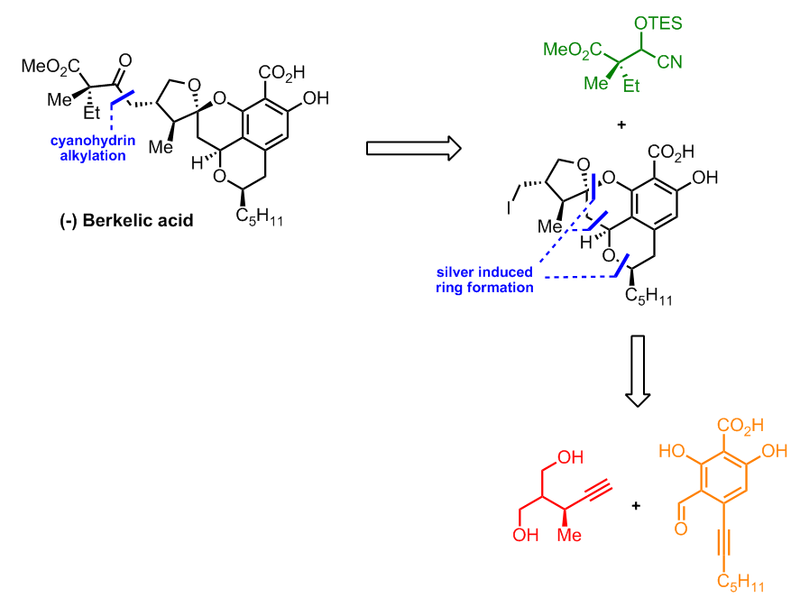 Berkelic acid is a rather old target to the synthetic community and three total syntheses have been published to date. Interestingly the material provided by synthesis produced contradictory biological results compared to earlier studies. So besides showing the power of their methodology the group planned to provide enough material for refined studies. As can be seen from scheme 1 the group planned to construct almost the whole framework in one single step after disconnection of the side. It should be noted that the group has some experience with this kind of cascade transformations of which they can rely on. Nevertheless instead of employing palladium catalysts the group turned their attention to silver catalysis. 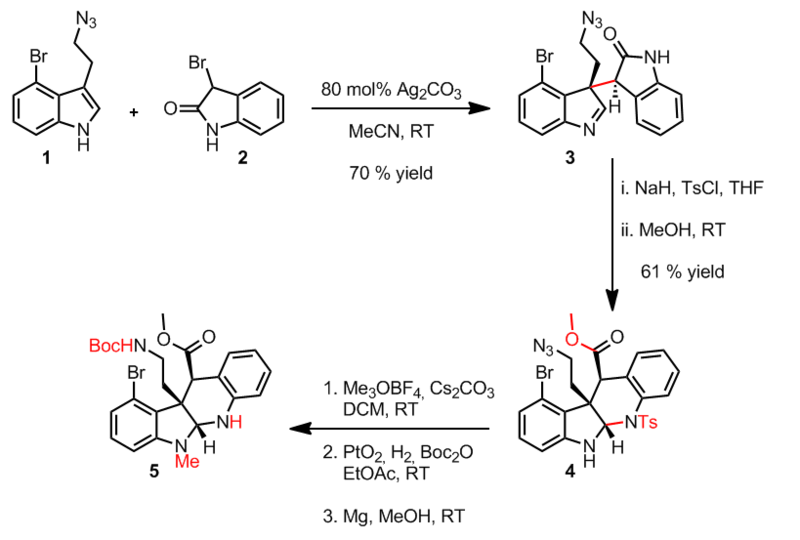 With this cascade reaction in mind they hoped that the stereogenic methyl group would control the stereoselectivity of the whole transformation. The three key building blocks were prepared in a straightforward manner. Starting from commercially available butynol 1 the hydroxy functionality was mesylated and replaced by diethylmalonate to give after complete reduction diol 2. Starting from ester 3 the second fragment was prepared by triflation of the least hindered hydroxy group followed by Suzuki cross coupling with the trifluoroborate of heptyne. Hydroxy-directed reaction with formaldehyde and subsequent oxidation produced ester 4. The last building block stems from dimethyl malate which was doubly alkylated in the first place. Then the a-hydroxy ester was used for a periodate cleavage followed by cyanohydrin formation which was catalyzed by PNPCl. Combination of the red fragment 2 and orange fragment 4 was accomplished in the presence of 5 mol% silver(II). Subsequent hydrogenation of the resulting double bond yielded 7 in good yield and diastereoselectivity favoring the desired one. 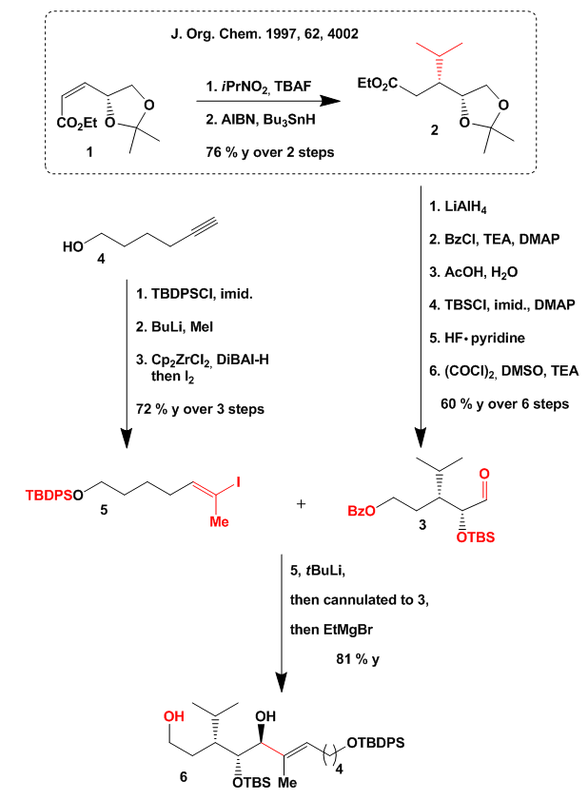 Appel reaction under standard conditions was followed by cyanohydrin alkylation and unmasking of the ketone to give protected Berkelic acid 9. Small amounts of Berkelic acid can be produced in good yield by selective saponification of the more active ester. This was only done when material was needed for testing or analysis as the natural product is a short-lived compound. The mechanism of the cool key step is presented below. 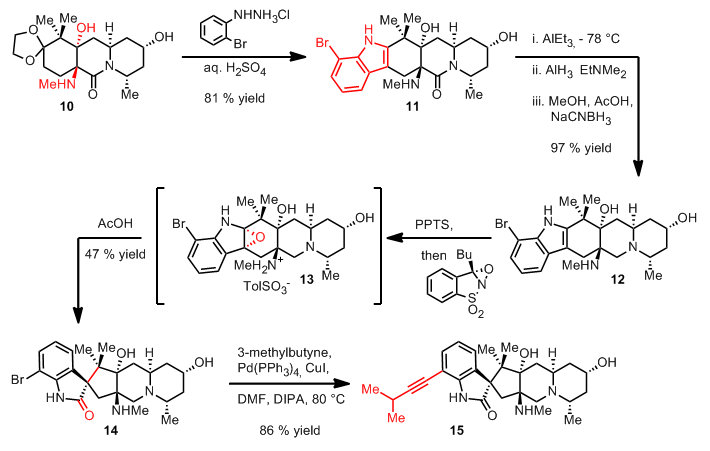 On one hand the red fragment underwent a 5-exo-dig cyclization thus desymmetrizing the propanediol moiety to give after protodemetallation a tetrahydrofuran ring. 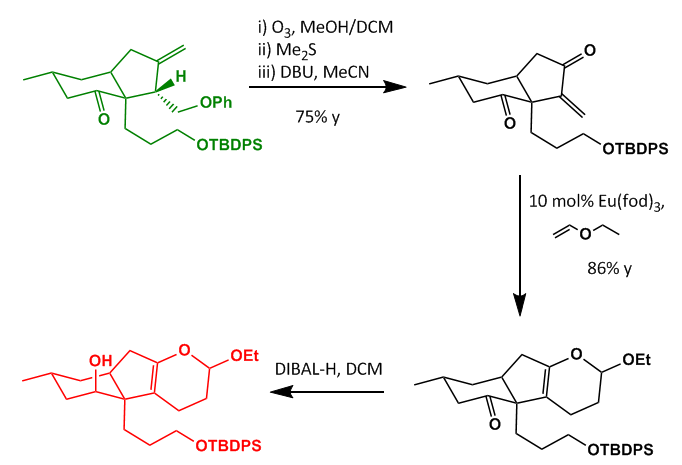 On the other hand the carbonyl of the orange fragment underwent a 6-endo-dig cyclization. Supported by keto-enol tautomerism of the hydroxy functionality an ortho-quinone methide is formed. Michael addition of the enol ether from the red fragment onto the quinone methide was followed by acetal formation by the phenol. Hydrogenation of the newly formed double bond then gave intermediate 7. It is the first time I ever saw this reagent in action. It is usually used for halogenation reactions. The cited paper in this step found that in the presence of PNPCl the cyanohydrin formation is much faster which was ascribed to an activation of the carbonyl oxygen by the high oxophilicity of phosphorous. At first sight one might think of a Diels-Alder reaction. But brief examination of the stereochemistry on the newly formed pyran ring shows that only a stepwise mechanism can form this particular anti-substitution pattern. Big THX to Bobby for proofreading. Dendrobine is the most abundant alkaloid isolated from an orchid which is used in traditional chinese medicine. The caged structure of this natural product is responsible for the interest of organic chemists in its synthesis. Retrosynthetically the synthesis is almost straightforward. 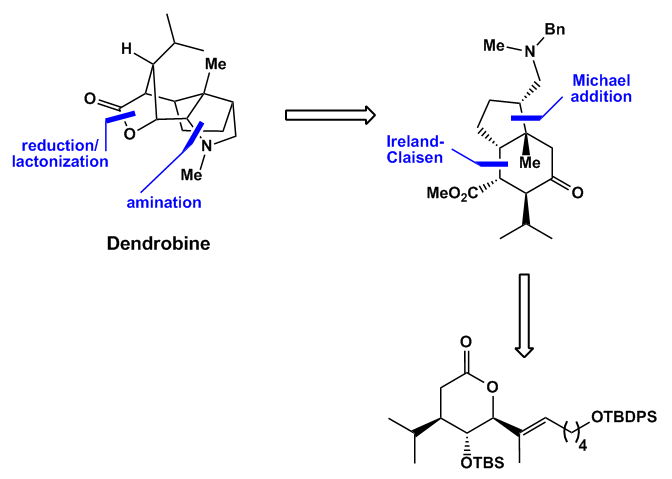 Opening of the lactone and intramolecular amination give a precursor which is easily built up through an Ireland-Claisen rearrangement and enamine induced Michael addition. Ester 1 which is easily accessible from commercially available material underwent a nice Michael addition with iPrNO2 to give after removal of the nitro group the cis-configured ester 2. The stereochemical outcome can be explained by using the Cornforth model. 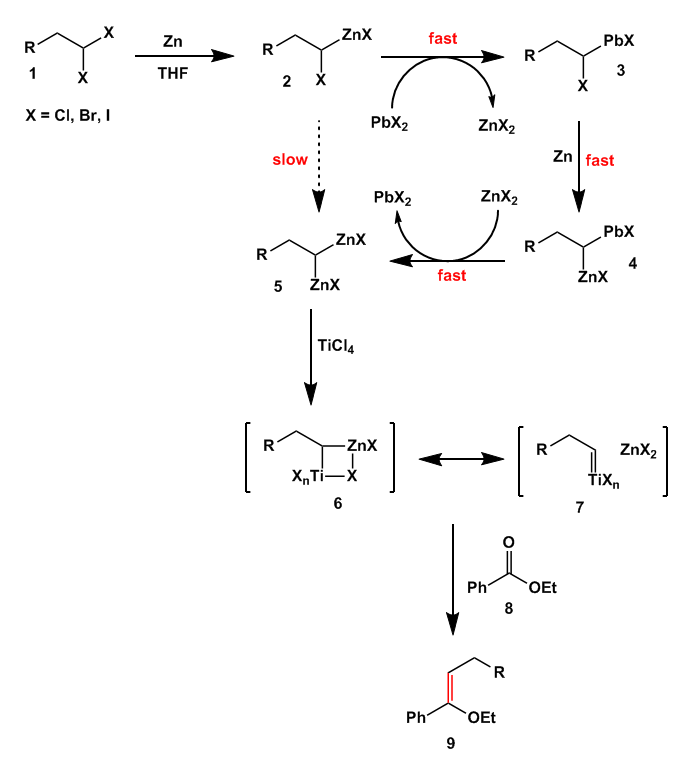 Excessive reduction with LiAlH4 was followed by benzoylation, acetonide cleavage, double TBS protection, selective mono-deprotection, and Swern oxidation of the primary alcohol to give aldehyde 3. Parallel to the latter synthesis the second fragment commenced with alcohol 4. Silylation, methylation of the alkyne, and iodination after hydrozirconation employing Schwartz’s reagent yielded iodide 5. 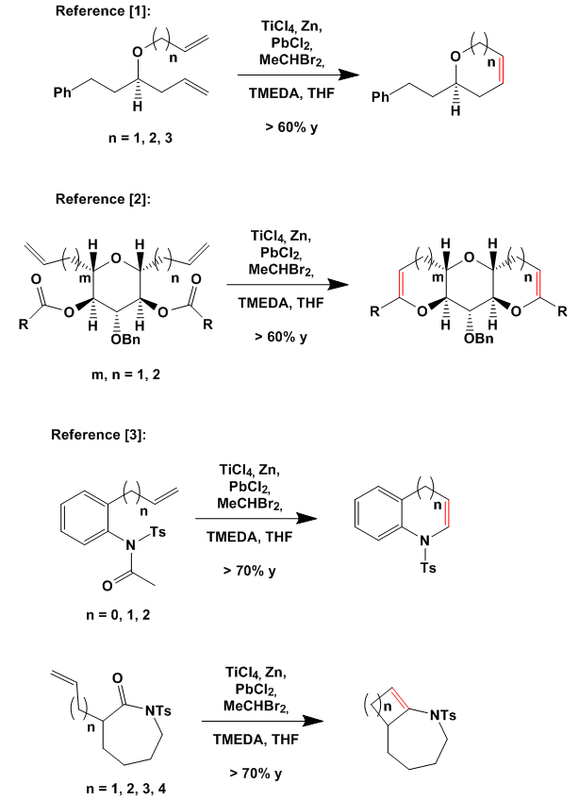 Both fragments were combined after halogen—metal exchange with tBuLi and one-pot deprotection of the benzoyl protecting group with ethyl Grignard to furnish advanced intermediate 6. The mechanistic rational of the enamine induced Michael addition is shown below. After formation of the enamine the unsaturated ketone is attacked from the bottom face to give presumably after some proton shifts another enamine. Reduction from the Re face delivered amine 10 while the benzyl group is cleaved off at the end of this sequence. The C-N bond formation was induced by PHT, a commercially available mild brominating reagent. It was hypothesized that the nitrogen is brominated first and delivers the bromine to the a-position of the ketone. DMAP was essential in this step because it epimerized this position and left the bromine in an ideal position for a SN2 displacement by the nearby nitrogen. Big THX to Bobby for proofreading and corrections. I will start this write-up with a question to all readers: what is the longest cascade reaction you can think of? I mean how many separate steps occur while the compounds react and rearrange and form new bonds. The longest one I thought is the Ugi-4CR with some concomitant steps e.g. condensation to form heterocycles. But all in all with a maximum of 8 reaction steps. 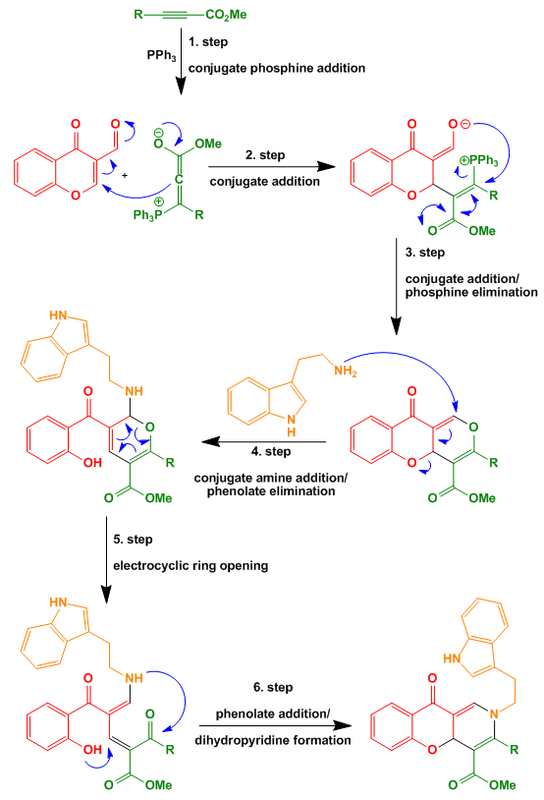 The first step is the Michael addition of PPh3 into the triple bond of the acetylenic ester. 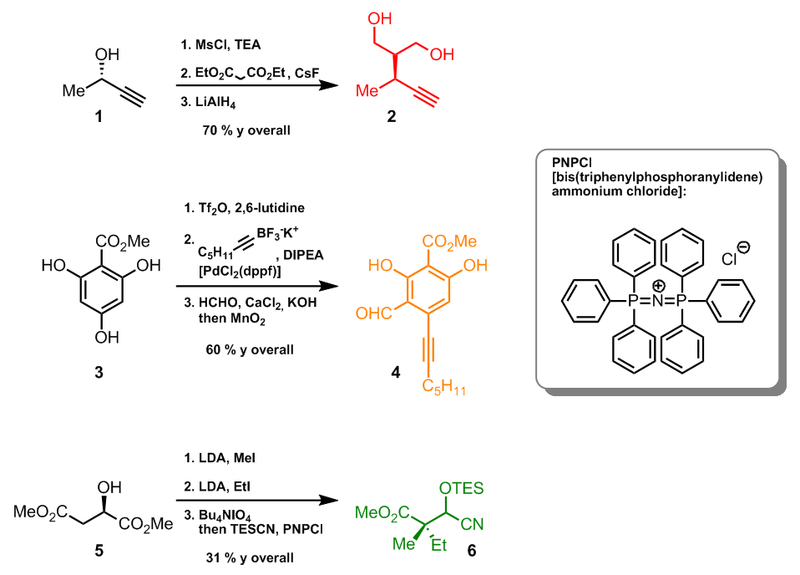 Vinylogous aldol addition of the so formed ester enolate and subsequent Michael addition of the newly formed enolate into the unsaturated ester gave a tricyclic compound after elimination of triphenylphosphine. Then tryptamine was added followed by 1.5 eq of CSA. Tryptamine attacks the unsaturated ketone which results in elimination of the phenolate. The formed 2H-pyrane undergoes an electrocyclic ring opening which closes again to a dihydropyridine ring system. Next the dihydropyridine eliminates again the phenolate forming a pyridinium ion which is attacked again by the phenolate to give a rearranged dihydropyridine. Electrocyclic ring opening yields an imine which undergoes a Pictet-Spengler reaction with the 2-position of the indole ring. 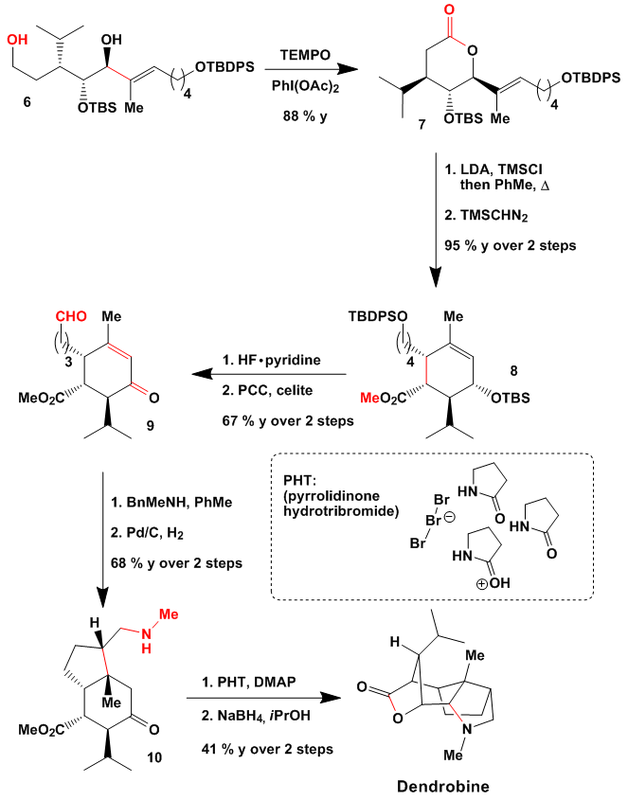 The last two steps contain another Michael addition of the tetrahydro-β-carboline nitrogen atom onto the unsaturated ketone and subsequent eliminiation of phenolate to give at last the indoloquinolizine skeleton. The yields ranged from 20 % up to 91 % in a single pot reaction and the procedure is rather simple: just mix PPh3, the aldehyde, and the acetylenic ester in hot PhMe. After about 5 minutes add the tryptamine followed by CSA and heat the mixture for another 5 to 30 minutes. The authors state that even they did not expect the last steps to happen. But some of the substances they got are very active in interfering with the mitosis of cancer cells. Originally published by Takai, Utimoto et al. 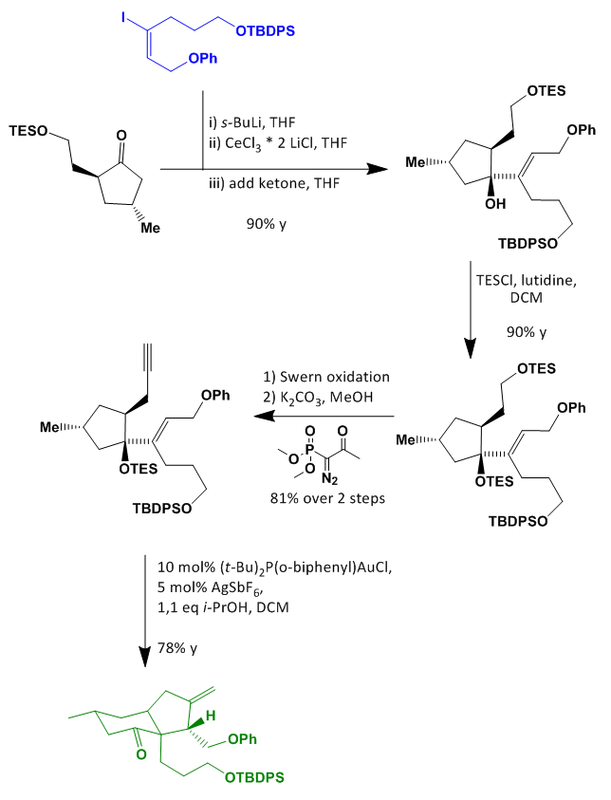 the group around Rainier optimized the reaction conditions and expanded the scope of this reaction from an olefination to an olefination/metathesis process. In 1978, Takai and Utimoto published an approach to olefins from carbonyl compounds by employing a reagent mix of CH2Br2 – Zn – TiCl4. After several groups were unable to replicate the results it was found that the zinc powder Takai and Utimoto employed was contaminated with lead. In 1994 another paper was published in which they described optimized conditions and expanded the scope of the reaction to esters. First the geminal halide 1 reacts with activated zinc powder to form 2. Without lead the second metal-halogen displacement is extremely slow so it was proposed that before the second metal-halogen displacement takes place a transmetallation between 2 and PbCl2 forms the organo-lead-species 3. This is reactive enough to produce a geminal bisorganometallic species 4 which in turn reacts with in situ formed zinc halide to give 5. Then TiCl4 is added which displaced one or two of the zinc atoms to form a metallocyclobutane ring 6 or a Schrock carbene 7. Whatever product is formed it reacts with a carbonyl compound like the Tebbe or Petasis reagent to form an olefin. This was all known for some time before Nicolaou discovered that the Tebbe reagent can be used in a tandem olefination/metathesis reaction. 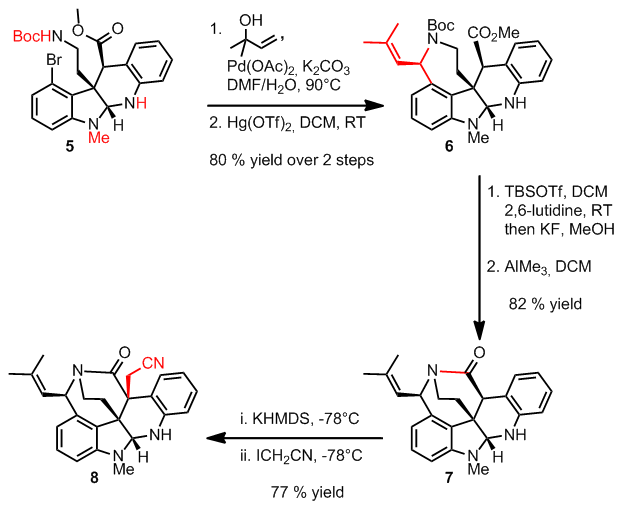 Unfortunately I was very busy the last weeks with studying but now the last exam is written so I took the advantage and finished to review this nice paper from Overman et al..
Sieboldine A presents in my eyes a classical Overman target because of the rigid alkaloid structure ready for cool rearrangement chemistry. The compound itself inhibits electric eel AChE with an IC50 value comparable to that of Huperzine A (https://syntheticnature.wordpress.com/2009/11/23/total-synthesis-of-huperzine-a/). 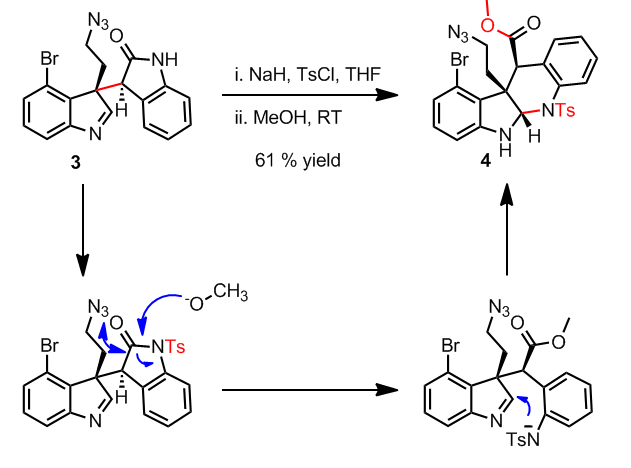 But the real interest for a synthetic chemist poses the unprecedented N-hydroxyazacyclononane ring which was unknown until the isolation and structure elucidation of Sieboldine A in 2003. 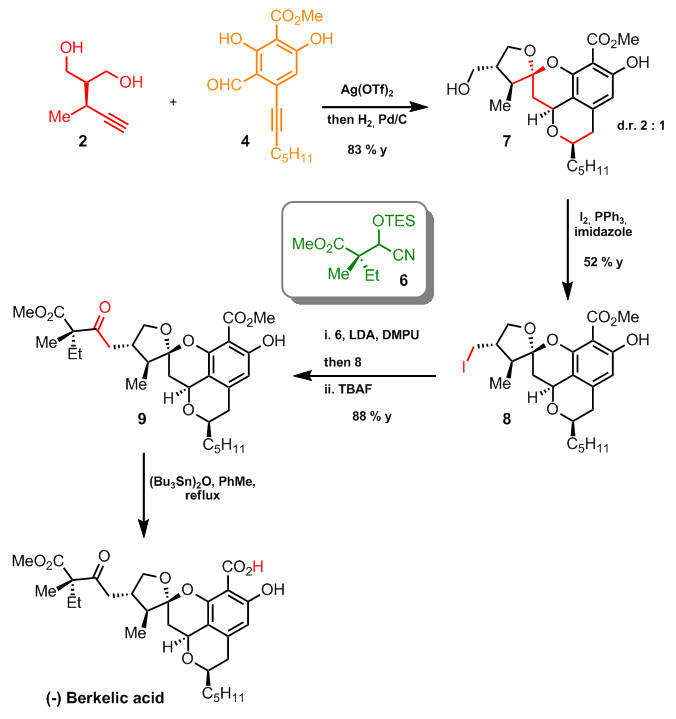 Retrosynthetically spoken the first step cleaves the sensitive N,O-acetal. The precursor derives from a Diels-Alder product which in turn was produced by a sweet pinacol-terminated cyclization. 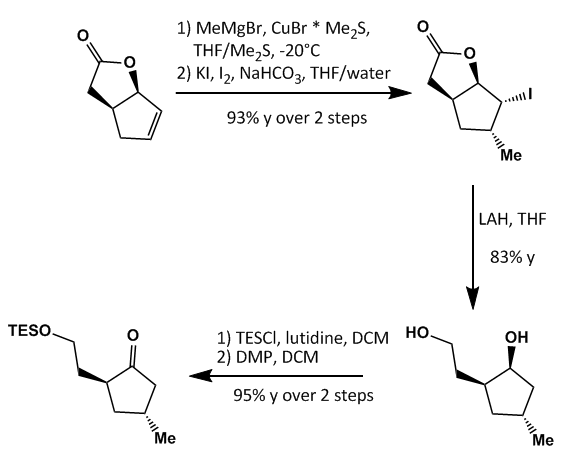 The synthesis starts off with the known unsaturated lactone which was opened by diastereoselective Michael addition of methylcuprate and subsequent lactonization with iodine. Exhaustive reduction with LAH furnished a diol which was selectively monoprotected and oxidized to give the ketone shown. The second intermediate was synthesized through a known route. 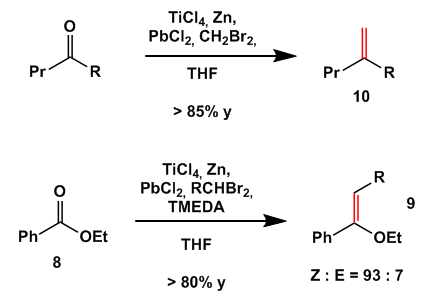 Michael addition of tributyltin-cuprate complex on the alkyne and quenching the reaction with MeOH gave z-vinyl tributyltin ester. 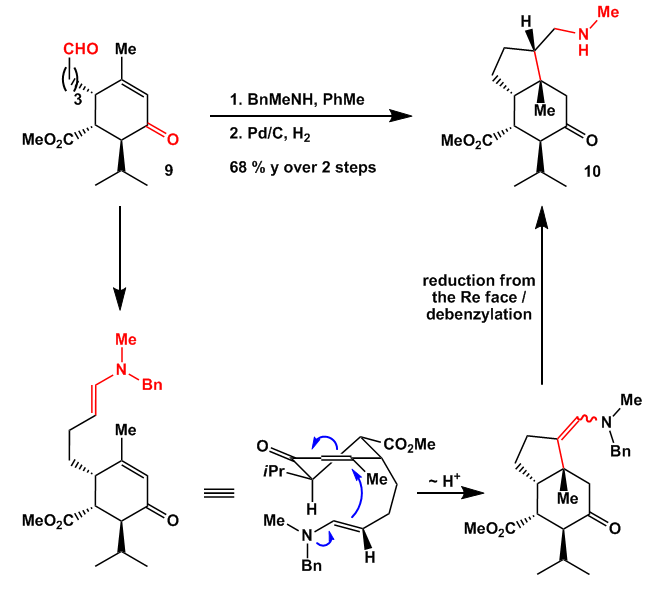 This was reduced with DIBAL-H, exposed to Mitsunobu conditions to produce the phenyl ether and converted to the iodide by halogen/metal exchange. Next both intermediates were combined by reacting the iodide with sec-BuLi, transmetallate the lithium species with cerium trichloride and add to this the ketone (all at -78°C). 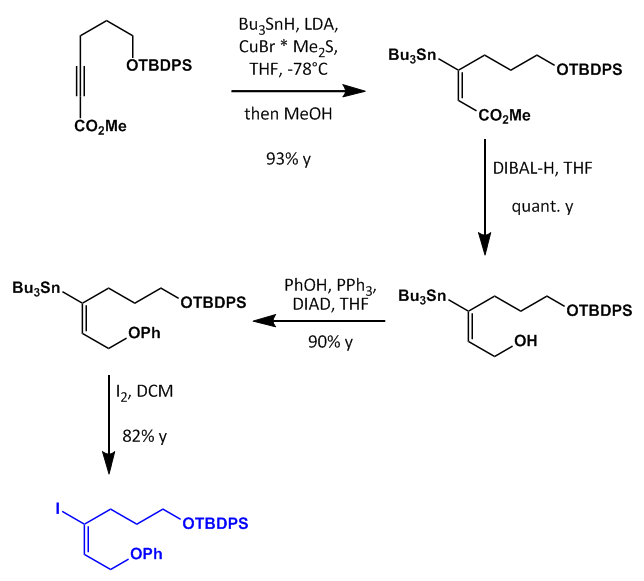 Protection of the resulting alcohol, Swern oxidation of the terminal silyl ether (which was deprotected under the reaction conditions) and Seyferth-Gilbert homologation utilizing the Ohira-Bestmann reagent yielded the terminal alkyne ready for the first key step. Exposure of this to a bit of gold and silver produced two of the four rings needed in a nice tandem Prins/pinacol rearrangement reaction. 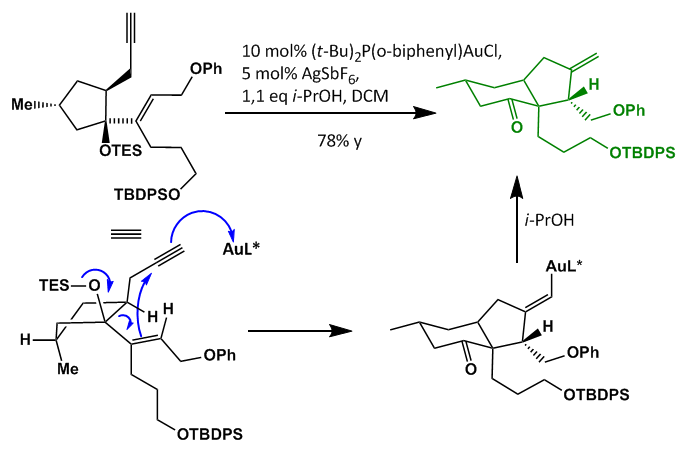 The gold attacks the terminal alkyne which in turn is attacked by the alkene through a 5-exo-dig cyclization. The resulting tertiary carbenium ion is neutralized by a pinacol type reaction of the TES-ether to give the vinylic gold intermediate which is protonated by i-PrOH. Having most of the carbon skeleton in place the group turned their attention on the next key step. Ozonolysis of the exo-methylene group followed by neutral work—up with dimethylsulfide and subsequent phenolate elimination produced another exo-methylene group. This underwent a europium catalyzed Diels-Alder reaction with ethyl vinyl ether. 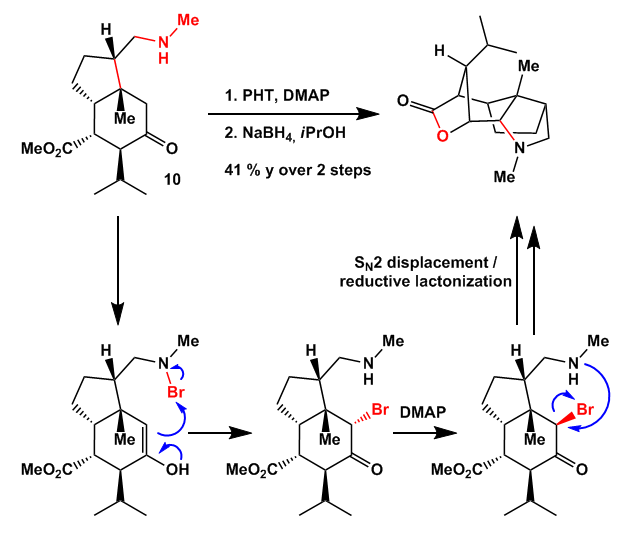 Diastereoselective reduction of the ketone was followed by facial selective expoxidation with DMDO. 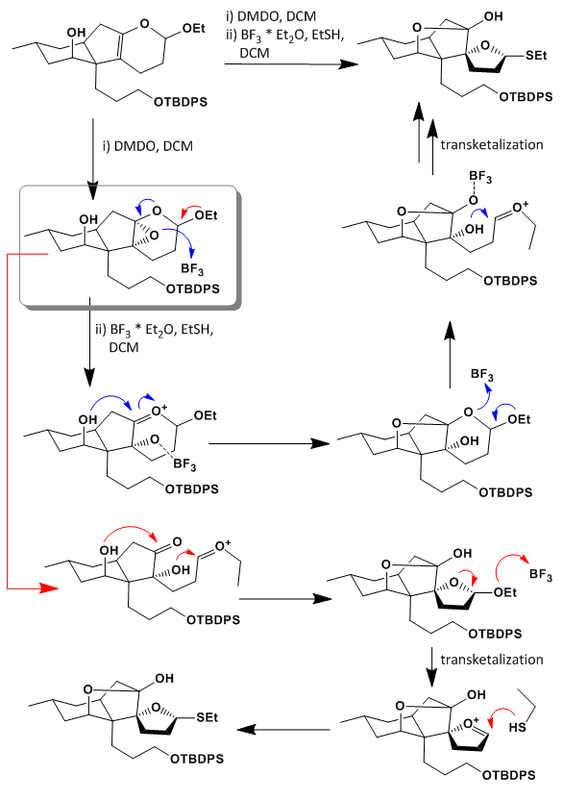 The resulting epoxide was opened in the presence of ethanethiol with BF3-etherate in a sweet Overman style reaction. 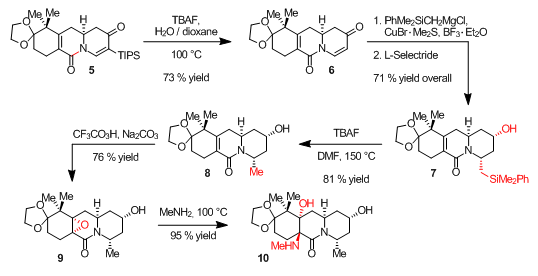 Desilylation, Mitsunobu reaction with double protected hydroxylamine and removal of the nosyl protecting group furnished an odd looking hemiacetal. Next some carbohydrate chemistry was utilized which is completely new to me to close the last ring (if someone has access to the paper, mail me). 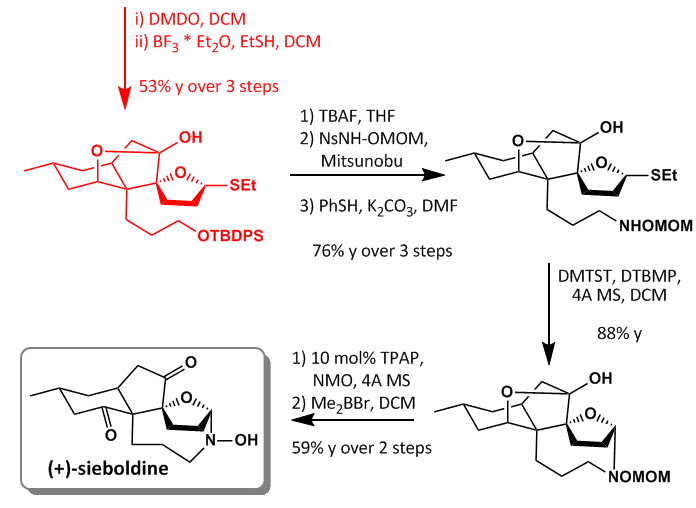 Oxidation of the remaining alcohol and MOM-cleavage yielded at least (+)-Sieboldine in 5% yield over 20 steps in the longest linear sequence. The Diels Alder reaction inspired me to propose the two mechanisms below. I am not sure which one is right but I favour the red one. I loved the synthesis as usual when reading Overman’s work. 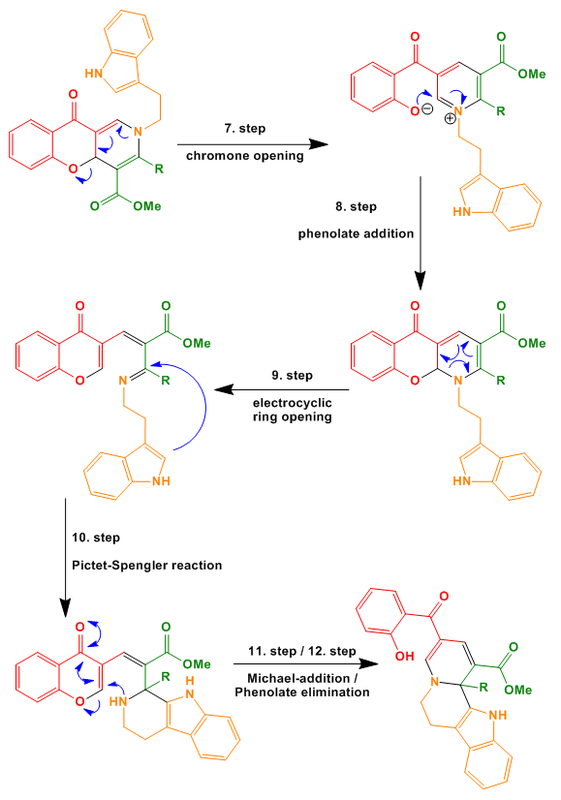 Especially the pinacol-terminated cyclization, the Diels-Alder reaction and the ring opening/ring closing cascade.